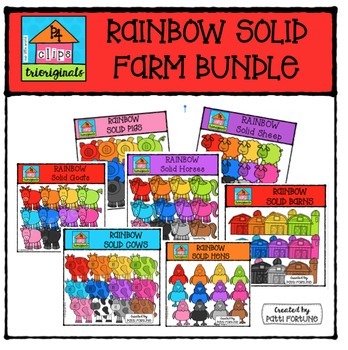 RAINBOW Solids "On the Farm"
You might also like the Dots Collection as well! Please enjoy the use of my graphics for your personal lessons, documents or creative work. All graphics must be incorporated into an original design or resource before shared and are not to be redistributed as digital clipart pieces on their own. To be sure that the clip art graphics cannot be copied and used by others, please make sure all digital files are secured in a pdf file or another secured format.